Here is how you make a fake mojito (if for some insane reason you are inclined to do so). Makes a refreshing drink here in the late summer. 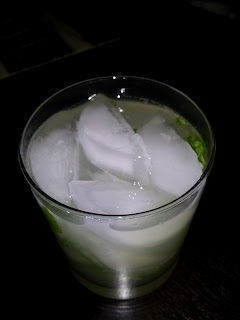 Muddle 1.5 ounces of simple syrup (you can use 1 oz if you want it less sweet) with about 5-6 fresh, washed mint leaves. Add ice to the top, then add 1.5 ounces of lime juice and approximately 3 ounces of club soda (I top it off with the club soda and 3 ounces does the trick). Mix it once or twice (I dump to another cup and back) and voila, faux-jito.